I think it is amazing that anyone could amaze Jesus! Who was this incredible person? What qualified him of such status? We read about him in the gospels. He is a captain in the Roman army, an unnamed centurion, overseeing about one hundred men. His solid reputation among the Jews, sincere concern of his slave and love for the nation qualifies him a notch above the norm. He also helped build the synagogue. These attributes make it clear he was not the typical army commander of that day. Packing these characteristics into one human is enough to amaze me! Though the word “love” only appears once, it permeates all he does. Whether behind closed doors where only servants witness or in the public square, a love that went above and beyond marked his life. To amaze means to fill with astonishment, to take someone’s breath away, to stun or leave someone open-mouthed. Somehow, I have a hard time visualizing Jesus in this way. Yet it is true! Why was his faith amazing? The recorded interaction shows he had a firm understanding of authority. “… say the word, and my servant will be healed. Authority combines both legal ability and authorization to exercise power. It also carries the strength for enforcement. Power is the actual exercise and use of the power and influence of authority. Authority is the permission granted to actually carry out a task. Power is the force exerted to complete it. Everything Jesus did (His power) flowed from this place of authority. 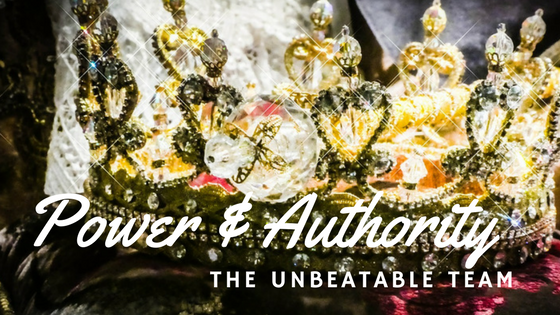 In Christ, authority and power presented an unbeatable combination. Whether it was words of healing, calming a storm or blessing a meal, Jesus moved in both power and authority. Snakes and scorpions were the cause of excruciating pain and even death. Walking in the authority of Christ produces the ability to overcome. That is good news! Jesus came with power and authority, teaching and doing all the Father instructed. Just as the Father sent Jesus into the world with power and authority, so Jesus is sending each of us. I honestly haven’t grasped the measure of this truth, but I’m working on it. Do you believe Jesus would send us out on mission ill-equipped or unprepared? Absolutely not! Everything we need to do even greater things is at our disposal. Through Jesus Christ and the presence of the Holy Spirit, we have the capacity to walk in both power and authority. It truly is an unbeatable team! The centurion, the twelve disciples, Smith Wigglesworth and countless others took hold of the winning combination of authority and power. For you or I to rank in the mix, we must grasp not only the concept of authority but take the nature of a servant, like the centurion did. I action flowing from a heart of love impact our generation. Do you believe it is still possible to amaze Jesus? Jaw-dropping astonishment might occur more often as faith is put into action. Yes! That is our hope! Would you like to receive your blog update automatically? Join here! ← Trophies of Victory! Bring the Trophy Home!